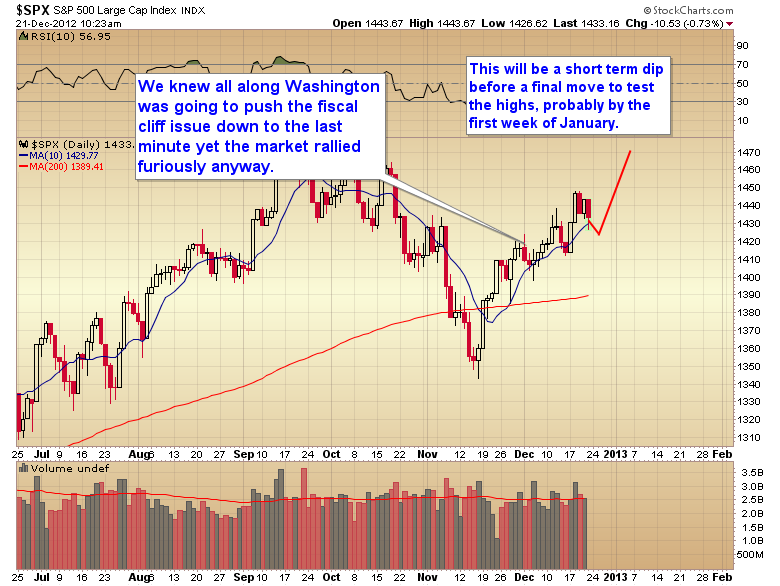 The stock market has known all along that the fiscal cliff issue was going to be pushed out to the last minute. This is just how Washington works. Nothing is ever settled until everybody gets all of the pork needed to buy their vote. The correction today is nothing more than a short-term breather before the market makes a final push to test the all-time highs, probably by the first week in January. I’m guessing we will get some kind of stopgap measure, or extension of the deadline next week that will trigger another explosive move up to test those September highs. At that point the market will find some excuse to drift down into a daily cycle low around the middle of January. Once a deal is struck the daily cycle correction will end and the market should explode to new highs, maybe big new highs by the state of the Union address on January 29. The gold market however has been rather confusing of late. The selloff on the QE4 announcement, especially the huge sell orders that hit the market late Wednesday night, made no sense at all. Now with the benefit of hindsight it’s apparent that the yearly cycle low that I was expecting sometime in April or May has been moved up to correspond with last year’s D-Wave bottom. 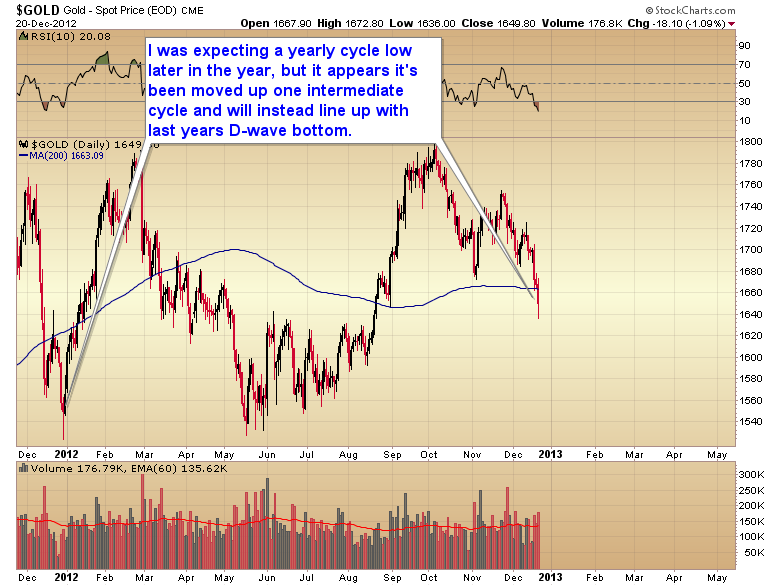 There is a possibility that that yearly cycle low bottomed yesterday. However it appears that we have a daily cycle low 10 days ago. 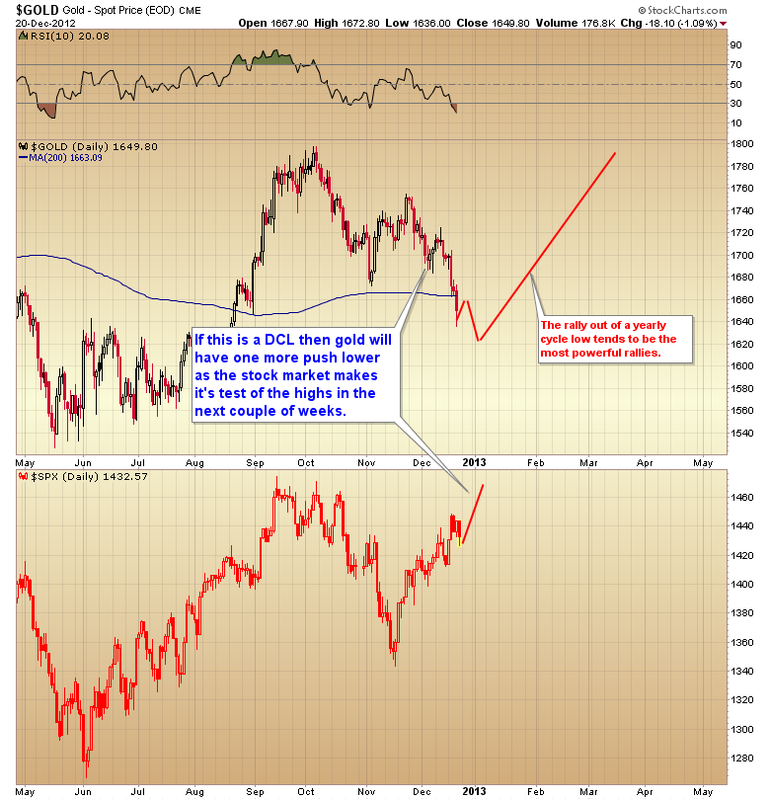 If that’s the case then after a short-term bounce gold may make one more move to marginal new lows as the stock market finishes its test of the highs in early January. The normal duration for a gold daily cycle is about 18-25 days. Unless this turns out to be an extremely stretched daily cycle then gold probably has one more curveball to throw us before a final yearly cycle bottom. Those of you still holding positions in the precious metals market I would strongly advise you to not lose your position in the next couple of weeks if gold does make another marginal new low. If you are back in cash I think I would advise waiting to see how gold reacts as the stock market launches out of this short-term correction. Like I said that may be the trigger for gold to move down into the normal timing band for a daily cycle low and possibly a marginal break below yesterday’s intraday bottom. If it does, that should mark a final yearly cycle bottom and trigger a big rally back up to test the September 2011 all-time highs. This entry was posted in Uncategorized on December 21, 2012 by Gary. This entry was posted in Uncategorized on December 20, 2012 by Gary. 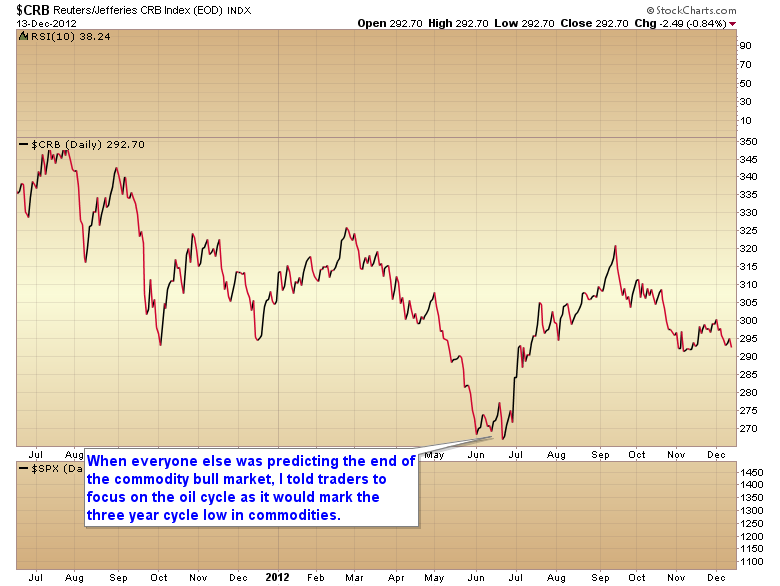 Last summer I told traders to watch the oil cycle as the CRB was working its way down into a final three year cycle low. At the time I was confident that the entire commodity complex was just waiting for the oil cycle to bottom. Once it did, the rest of the commodity complex launched out of that bottom like a rocket. Remember at the time virtually every analyst was predicting the end of the commodity bull market. I knew that was baloney. All that was happening was a completely normal decline into a major three year cycle low. 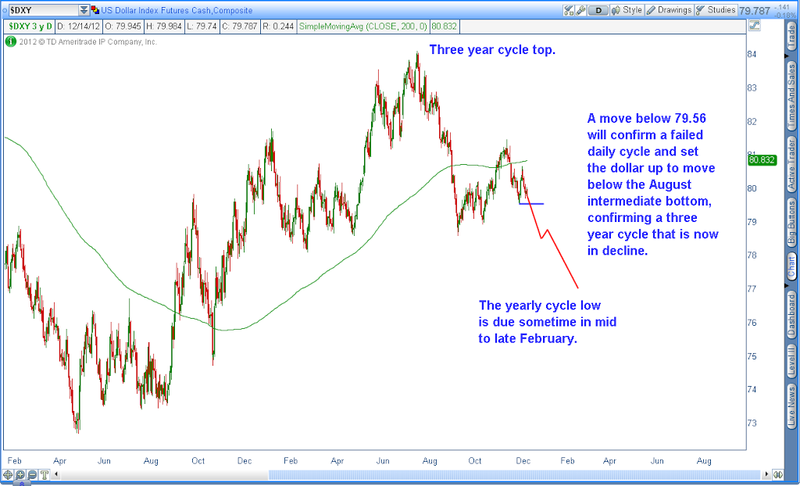 I also correctly predicted that the bottom in the CRB would mark the three year cycle top in the dollar. As expected the dollar made a halfhearted attempt to regain the 200 day moving average before rolling over in anticipation of QE4. At this point all we are waiting for is a move below the last daily cycle low at 79.56 to confirm the intermediate cycle has topped, and done so in a left translated manner (left translated cycles are an indication of a cycle that is in decline and making lower lows and lower highs). Once 79.56 is breached the dollar will be on its way down into its yearly cycle low sometime in mid to late February. My best guess is an intermediate bottom somewhere around 76-77 before another mild bounce like we witnessed out of the August low and then a continued collapse of the worlds reserve currency. Since September when the dollar began it’s pathetic countertrend rally, the CRB has been moving down into its first corrective phase. At this point I think the entire commodity complex is just waiting for the leader to turn. And by leader I mean natural gas. As you can see in the chart below Nat gas led the entire commodity complex out of that major three year cycle low. I think Nat gas began a new cyclical bull market in April. This was the point at which currency debasement overwhelmed the supply/demand fundamentals of a saturated Nat gas market. I don’t believe for a minute that this bull market is being driven by supply and demand fundamentals. I think this market is being driven by the same thing that the entire commodity complex is responding to, and has been responding to since last summer, and that is massive global currency devaluation. As you can see in the chart above the natural gas cycle is now deep in the timing band for a turn. 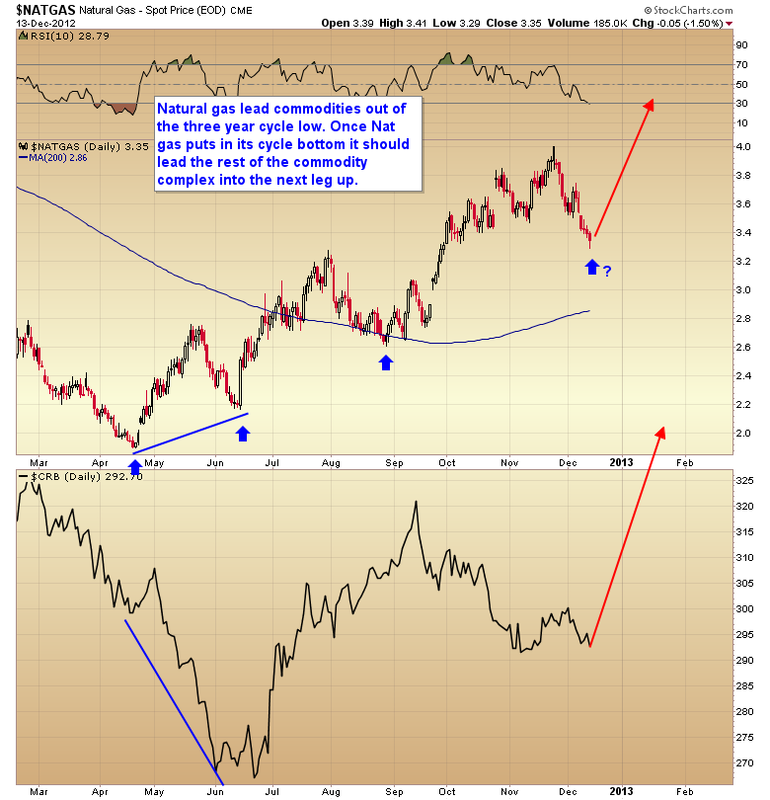 I suspect when Nat gas forms a swing we will see oil, gold, silver, and the entire commodity complex begin another leg up in what I expect to be a severe inflationary spiral culminating in at least a mini currency crisis in mid-2014. 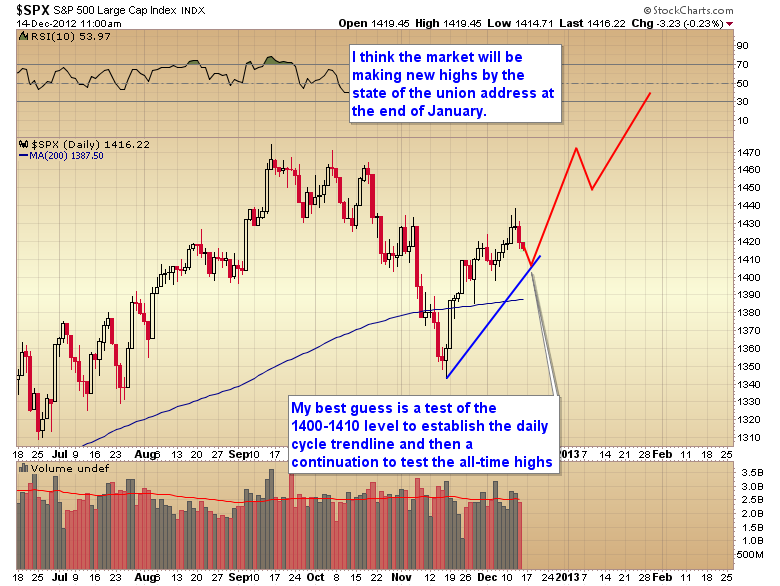 As predicted the stock market rallied violently out of its intermediate bottom logging a 7% gain on the initial thrust. We can now expect stocks to take a breather as a minor profit-taking event unfolds and the stock market moves down into its half cycle low. My best guess is we will see a bottom somewhere between 1400-1410 followed by a move up to test the all-time highs, probably by the end of the year (especially if we get a resolution to the fiscal Cliff in the next week or two). But if Congress manages to drag this into the new year, then I think we can expect fiscal cliff resolution and at least a marginal break of the September highs before the state of the union address on January 29. So for commodity traders I think we are just waiting on the natural gas market to bottom before the next leg up begins. This entry was posted in Uncategorized on December 14, 2012 by Gary. I think we are on the verge of entering the euphoria stage of this cyclical bull market. The euphoria phase is where the rate of change starts to accelerate as traders become convinced that the economy is booming, and will continue to boom into the foreseeable future (the last bull market), or in this case that QE3 is a magic elixir with no unintended consequences. During this final phase the character of the intermediate cycles should change and instead of a modest move above the prior intermediate top we will see a strong acceleration and a significant and sustained breakout above the September high of 1475. All of the traders that have convinced themselves that QE is having less and less effect are about to be caught off guard as we move into the euphoria phase of the bull market. I think we are on the verge of something similar as I believe QE3 will drive the market high enough to test or marginally break the all-time highs. However, it’s also going to start an upward spiral in commodity inflation that will eventually poison this fragile economy and be the straw that breaks the camels back. For the next couple of days I’m going to run a Christmas special, one penny for the month of December. This is only valid for new subscribers. 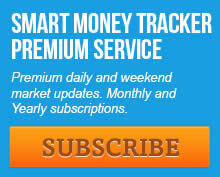 If you have already subscribed to the SMT premium in the past the system will charge you the regular $25 monthly rate. At the end of the month your subscription will convert to the normal monthly charge unless canceled before then. This entry was posted in Uncategorized on December 2, 2012 by Gary.